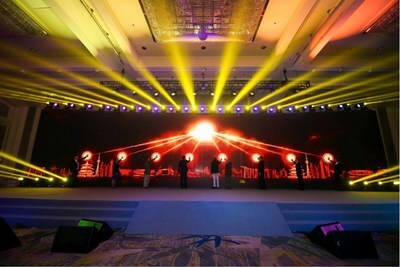 BEIJING and SHANGHAI, April 14, 2019 /CNW/ -- With an electronic laser light show to get the evening started and an impressive tech-inspired button push to end the night, China Europe International Business School (CEIBS) has launched the China leg of its 25th Anniversary Celebration with parallel ceremonies in both Beijing and Shanghai. The launch followed an alumni-led CSR forum in the capital, and throughout the entire day there was a recurring theme of CEIBS' role in educating business leaders who go beyond financial success to achieve global significance. CEIBS President Li Mingjun during his speech from the Beijing Campus. CEIBS President (European) Dipak Jain addressed the twin-city audience from CEIBS Shanghai Campus. Renowned economist and CEIBS Honorary Professor Wu Jinglian looked back at his 30-year journey with the school. “I grew together with CEIBS,” he said. 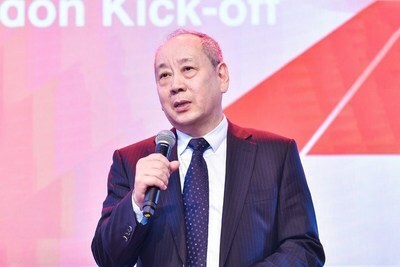 President of CEIBS Alumni Association and Chairman of Landsea Group, Tian Ming, told the audience that CEIBS has now “become an indispensable part” of his life. 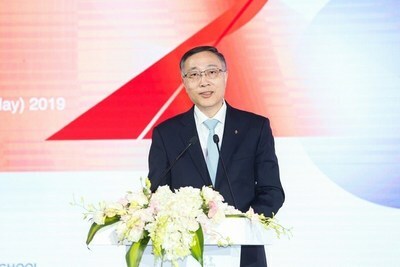 CEIBS Vice President and Co-Dean Zhang Weijiong thanked all those who have contributed to CEIBS’ growth over the past 25 years then led a high-tech button push to launch the celebrations. 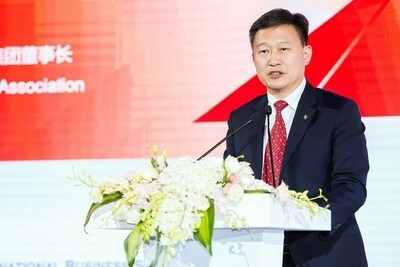 CEIBS' commitment to educating responsible business leaders was reaffirmed by the school's President Li Mingjun in his welcome speech to those gathered at the school's Beijing Campus, and broadcast live to a packed auditorium at the school's flagship Shanghai Campus. "We want to develop business leaders who can make a positive impact on the society," he said. 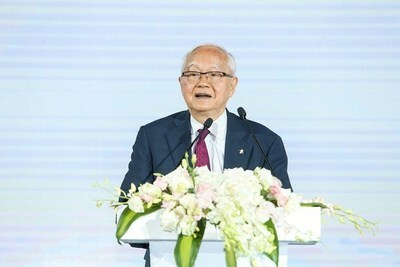 While sharing highlights from his 30-year journey with CEIBS, renowned economist and CEIBS Honorary Professor Wu Jinglian noted that "social responsibility has become a very important part of CEIBS' mission statement." 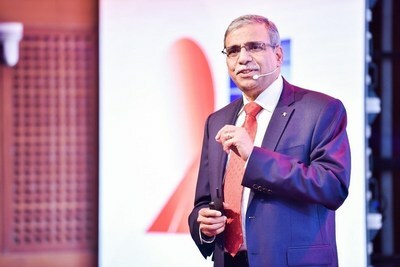 And in his look ahead at CEIBS' future, President (European) Dipak Jain told the audience that, "there is a much bigger journey, one that is about making a difference in other parts of the world." In addition to the school leadership's inclusion of CSR at the organization's strategic level, CEIBS alumni have also made it a major focus. It is the theme for all their upcoming annual meetings and today's CSR forum served as the backdrop for the release of CEIBS' second annual CSR report, a joint project between the school's faculty and alumni. Along with the strong CSR theme, today's launch was also an opportunity to reminisce and look ahead to the future. In his speech President Li also spoke about the challenges and accomplishments of the last quarter century, during which the school — a successful joint venture between China and the EU — has played a major role in strengthening the relationship between both sides. He also looked ahead to the role CEIBS will play in shaping the future of the global economy. "With China's increasing global status and the deepening integration of its economy with the rest of the world, the focus of global management education is also shifting to China," he said. "CEIBS will continue to shoulder important missions in the future. Today, I hope as we all relive the path that CEIBS has travelled, we will also embrace — and move forward with — the school's time-honoured traditions." Meanwhile President (European) Jain shared the school's plans to — while maintaining its focus on China — enhance its international visibility, build a strong presence in the US through partnerships with other schools and companies and strengthen its European and African initiatives. The next eight months of anniversary celebrations will span 11 cities across 4 continents and is expected to help boost the school's visibility outside of China. Today's dual-city celebration follows the international anniversary launch in Ghana on April 9, which included a signature CEIBS 1+1 Lecture at the school's Accra Campus. In the coming months, there will be 5 major conferences overseas. The first of these will take place on May 15 in Boston, USA, and will explore the topic of the increasingly important digital economy. On July 5, a special Munich Forum will focus on how China and Germany can work together in the context of changing consumer needs and the technological revolution. Then, on July 12, CEIBS will host a Roundtable Workshop in Brussels, where a carefully selected group of participants will discuss Sino-EU economic cooperation. China Europe International Business School (CEIBS) is among the top international business schools in Asia, where it is the only one to have simultaneously made it to the Financial Times' top 5 list of global MBA and EMBA programmes. CEIBS has more than 22,000 alumni from over 80 countries worldwide, and over the last 25 years has provided a broad range of management programmes to more than 160,000 executives both at home and abroad. It also offers a Finance MBA, Hospitality EMBA and a wide range of Executive Education programmes. With a faculty team that has extensive China knowledge and global insight, CEIBS is uniquely equipped to nurture business leaders, at every stage of their careers, preparing them to make a global impact. An unrivalled China expert, CEIBS is guided by the concept of China Depth, Global Breadth. This is tangibly reflected in the school's activities and operations at its 5 campuses across 3 continents. CEIBS has campuses in Shanghai, Beijing, and Shenzhen in China, as well as Zurich in Switzerland, and Accra in Ghana.